We had this sectional for a month and we like it so far. 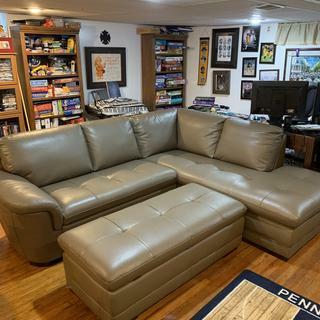 The seat depth and height of this sectional are shorter than other sectionals we looked at, so it doesn't take up too much space in our small living room. I personally don't like to lay back on the sofa so the seat depth is just right for me. Some of my friends who are used to fabric sofa said it's a too firm for them, but I think the leather and cushion are comfortable as I am used to firm mattress anyway. (I love to take a nap on the chaise.) Definitely look for an accent chair and a smaller rectangular or round/oral coffee table/ottoman to go with it. Our old rectangular coffee table looks disproportionate. Good quality, great combo of style, comfort and function. Fits perfectly in the living room. Nice color. Couch is very comfortable and fit into our ‘man cave’ nicely. The room is used mostly by our son to play video games. The couch gives him a comfortable place to sit. The leather is soft and the support firm. Great couch for a smaller ‘man cave’. We are so pleased with the lovely sectional we bought just last Sunday. Our salesman, Matt, was not a hard sell. He was unobtrusive and helpful. He even called today to see how beautiful it was in our living room. The whole sales experience was convenient and completed over the phone. Delivery was quick and on time. My daughter and her husband was looking for a sleek, slim leather couch. This piece of furniture is very durable yet soft and strong as they have a dog. It looks awesome in their home. One of the best purchases made. If anyone is looking for a slim sleek look this is your go to couch. can the Garrison chaise be bought separately? BEST ANSWER: The Garrison chaise can be purchased individually. For assistance, please contact Online Sales at 866-383-4484, option 3. The connectors on my sectional came unconnected how do I reconnect very heavy to move? where is garrison furniture made? BEST ANSWER: The Garrison Sectional is made in China. Is the leather full grain or bonded? This is very important to|me in choosing a leather sectional sofa. Thank you. BEST ANSWER: This Bellanest piece is constructed with 100% semi-aniline leather. Bellanest normally uses a top grain leather on the seats, arms and back rest of their pieces and a split grain for the back and side panels. can the legs be unscrewed for it to fit through the doorway? BEST ANSWER: Yes, the feet for the Garrison are removable.